Rely heavily on quads (4-sided faces) and avoid triangles and n-gons (>4 sided faces). Quad based meshes will allow you to easily deform your mesh using edge loops. They also help avoid poles (see next). Avoid poles. Poles are places where 3 or 5+ edges meet. Poles terminate edge loops, which can sometime be a useful thing, and so should be used sparingly. I mentioned edge loops. Edge loops are nothing more than continuous edges. Parallel sets of edge loops make a face loop which is just an uninterrupted series of continuous faces. Edge and face loops are nice because they allow you use the loop cut tool to divide them to create more refined meshes where you need them. Edge and face loops are your friends and can only be created with quads. To get started, you’ll want to set your turnaround views as background images for the front (Numpad 1), right (Numpad 3), and rear view (Ctrl+Numpad 1). Once imported in you can adjust the image placement and scale to line up between the views. Remember it doesn’t have to be perfect, just close enough to get a good idea while you’re modeling. Also make sure you’re in orthographic view (Numpad 5) otherwise you won’t see your backgrounds. Now that you have your reference backgrounds set, it’s time to create your base mesh. The method I used to do this is called block modeling. You start with simple primitives – box, sphere, cylinder, etc – and refine them to your desired shape. For character modeling it’s actually good to start with the default box primitive in the default scene. But you’ll probably want to keep your mesh symmetrical over the X-axis (from left to right). Blender has a nice trick to achieve this with the Mirror Modifier. To do this make sure your box is selected (Right Click the box until it’s outlined orange) then enter Edit Mode (Tab). Next add an Edge Loop right down the Z-axis (up/down) in the middle by hitting Ctrl-r and move the cursor until the purple line is vertical, then Left Click then immediately Right Click to center the line. 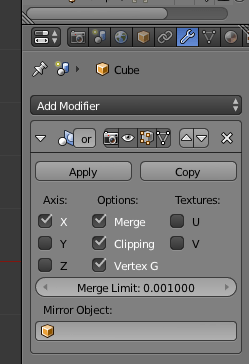 Next unselect all vertices (a) then Ctrl-Left Click and drag over the left two vertices so that the whole left face is selected – if the back vertices aren’t selected when you do this turn off the ‘Limit selection to visible’ in the toolbar at the bottom of the 3d view. Once you have the face selected, type ‘x’ and select ‘Vertices’ to delete the left vertices. You should be left with half a box with the left side open. Next go back to Object Mode (Tab) and make sure your half box is selected and then add a Mirror Modifier across the X-axis with clipping on. 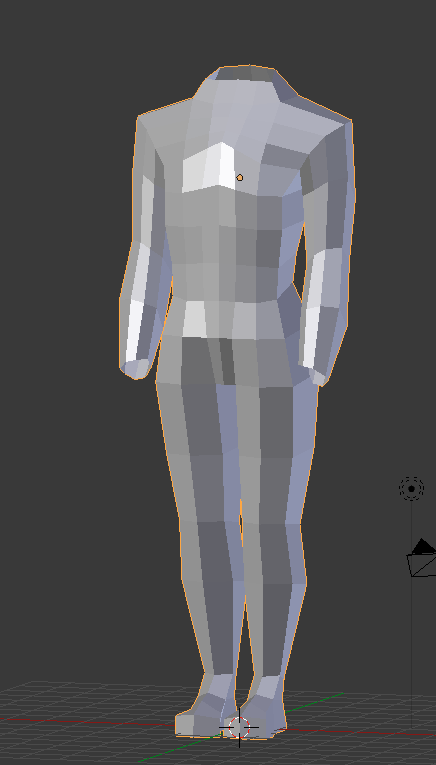 You can also turn on editing to the cage if you want to be able select vertices, edges or faces on either side. That’s it! If you’re completely lost at this point I highly recommend you watch Blender Cookie’s Introduction to Character Modeling. It’s an excellent series that will get you all the information you need to get started in Blender. Next article we’ll get started on a piece of the armor.